I can't say that any of The Punisher's wardrobe choices surprised me, but I can say that Jon Bernthal's portrayal of The Punisher on Netflix's Daredevil did surprise me. I knew he was a good actor from playing Shane Walsh on The Walking Dead, but I didn't expect The Punisher himself to have so much depth. ​The way Jon plays Frank Castle is amazing, and I love the way his classic style gets incorporated into the show. ​There are only a couple of different jackets that Frank uses in the second season. Throughout most of it, he's seen wearing an M-65 military style jacket. As the season progresses, his costume slowly changes and new things get added, the most notable here being his full length leather trench coat. ​As soon as I saw Frank wearing this jacket, I recognized the style; an M-65 military jacket. Quite a few characters I've written guides on wear M-65 style jackets. The most popular is usually the Alpha Industries M-65 field jacket, and I'm going to recommend it again here. I own one myself, so I know the quality is great, and of course the style is basically the same since they're both M-65 military style jackets. To me, it looks like Frank's wearing a different M-65 jacket later on in the season, and it more closely resembles the Alpha Industries version. I haven't been able to get good enough shots of it though to confirm a brand, but the gold-colored zipper of both the front of the jacket and the "hidden" collar hood look identical to the Alpha Industries M-65 I own. ​But what about the actual jacket Frank's wearing in Daredevil? It's discontinued, of course! I checked a few places, but The RPF is always the best place for quality info, in my opinion. Someone else had already asked about the jacket, and linked to this thread, identifying the ​jacket as a Strellson Ranger Utility jacket. And as I mentioned, it's out of stock everywhere, and no longer in production. ​If you want to grab something that looks as close as possible to The Punisher's jacket, I think this Brandit M65 jacket in indigo looks very close. The only thing that really stands out as a difference to me between this jacket and Frank's are the buttons down the front. The Brandit's aren't as big as the Strellson's. 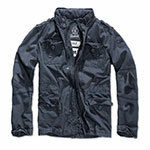 ​Last, I'd recommend the Rothco M-65 field jacket. It's bit different in style to the Alpha Industries one. The Rothco has larger front buttons down the middle, and the front hip pockets are aligned horizontally, like The Punisher's. ​We only get a few dark shots and promotional images of The Punisher wearing his full length leather trench coat, so it's hard to identify much about it. The biggest part of it's style that stuck out to me was the large collar. ​With so little to go on, I actually really like this leather trench coat by DashX. It's got a nice big collar, and big buttons on the front. It's a little over the top for every day wear, but I think it looks perfect for a Punisher costume/cosplay. ​Frank's wardrobe isn't what I'd call "diverse". When it comes to shirts, his closet must only contain long sleeve thermal shirts in gray and black. I love this kind of stuff though when it comes to costumes/cosplay. It makes it so easy. Brand names and styles don't matter as much with these shirts, the biggest thing is quality and fit. My recommendation for the thermals are American Apparel thermal shirts. ​For some reason they're labeled as "women's", but they're unisex. American Apparel shirts fit well, which is why I recommend them when I can. But you would probably get a better idea of fit if you went to your local clothing store. ​The Punisher's final bullet-proof vest is, as far as I can tell and have been able to find, a custom piece. However, the vest he uses earlier on in the season has been identified - its a 5.11 Tactec Plate Carrier, in black. ​Like his shirts, there isn't much variety in Frank's pants. To be honest, on my first watch of the season, I missed that he actually wears something other than jeans (outside of his prison time). They're just black cargo pants, but at least there's some variety. ​I wasn't able to find any exact information on the brand of Frank's jeans, but when the jeans are a classic style, I always feel safe recommending Levi's. They're reasonably priced, well-made, and most people have at least worn a pair in their lives. The Punisher's jeans are a classic fit, in a darker wash. I think the Levi's 505 jeans in "rinse" look nearly identical ​to his jeans. You don't want low-rise, boot cut, or any weirdly faded/acid washed parts. You'll also notice Frank wears his jeans at the more classic waistline (an inch or so below the bellybutton, as opposed to right at/below the hips). ​I'm not sure if Frank wears cargo pants at any other time, but I do remember seeing them in the shed scene with "The Blacksmith". Again, I didn't get any great looks at them, but they look like pretty basic black cargo/tactical pants to me. So with that in mind, I know these cargo pants in "#010 Black"​ would work great, since I bought them for my season one Daredevil costume. ​Thanks to the same RPF thread I linked above, The Punisher's boots have been identified as Bates Zero Mass 8 inch side zip boots. In case you weren't aware, Bates is the same brand of boots Matt Murdock uses for his season one black costume. ​I don't own a pair of the Zero Masses myself, but if the Amazon reviews are anything to go by, they may not be the most comfortable boots. Or maybe they take a lot of breaking in. 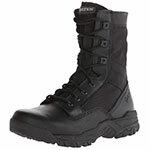 Either way, if you're hesitant to buy them and want something that looks similar, but cheaper, these Maelstrom tactical boots would work well. ​As with most men's belts, Frank's belt is simple. It looks like it's a wide black leather belt with a basic silver colored buckle. ​As usual, if I can, I like to recommend clothing that I own/have owned. This Carhartt Anvil leather belt would work perfectly as The Punisher's. It's wide, simple, and black. ​As I'm sure you can imagine, The Punisher has quite a few different firearms he uses. All of the guns used in Daredevil have already been identified on IMFDB, so I just tried to find the closest matches I could in airsoft versions. Umarex compact airsoft pistol - Springfield Armory XD Compact - this is the pistol Frank shoots Daredevil in the head with. Smith & Wesson 327 CO2 BB revolver - Smith & Wesson Model 327 Performance Center R8 - this is the revolver that Frank shoots Grotto with when he has Daredevil chained on the roof. UTG airsoft shotgun - Ithaca 37 (custom short barrel) - this is the shotgun The Punisher uses when going after Grotto in the hospital. BBTac M4 replica airsoft rifle - M4A1 with M201 grenade launcher - the assault rifle/grenade launcher combo that Frank uses to take out the motorcycles from the rooftop. V﻿elocity airsoft sniper rifle - Nemesis Arms Vanquish - the sniper rifle The Punisher is seen using right before Daredevil runs across the roof and kicks him. If I don't have a gun listed, that means either it wasn't on the IMFDB page, or I couldn't find a close enough airsoft variant. If you have any better suggestions, please let me know in the comments below. Yeah I would definitely agree with that. I think I link to BDU pants on my Oliver Queen Island guide, and they’d work really well for The Punisher too. No. Actualy, the cargo pants he use are the Crye Precision, but with the knee protection padle removed. I know it because they are the pants issued to the marine recon, the former marine Division he was enlisted in Kandahar, and they are my same cargo pants i use in the range. Most likely he uses a “gunbelt”, sturdy leather belt, to support the weight of the guns he caries. Perhaps the Hanks belts.